The Alaska gold rush wrapped up Monday at Kincaid Park, where Caitlin Patterson and Reese Hanneman captured victories in the classic sprint to give Alaska skiers all of the national titles awarded in four days of racing at the U.S. Cross Country Championships. Patterson, an Alaska Winter Stars and South High alum, completed a one-woman sweep of the four national titles up for grabs. 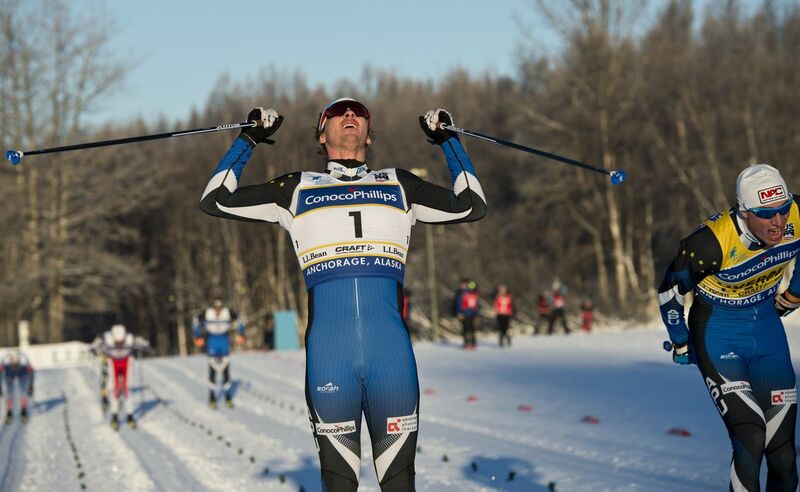 Hanneman, who grew up in Fairbanks and lives in Anchorage, won his second title of the race series to lead Alaska Pacific University to a sweep of the men's championships. Other titles during the six-day series went to APU's Tyler Kornfield and Scott Patterson, who both grew up in Anchorage. "We're all Alaska born-and-raised," Hanneman said. "Can't beat that." Only one skier among more than 400 who gathered for the six-day championships managed to steal a victory from the strong contigent of Alaskans. Hedda Baangman of Sweden, who skis for the University of Colorado, beat Patterson in Sunday's 20-kilometer classic, but because she is foreign, she isn't eligible for a U.S. championship. That made Patterson the 20K national champ. APU skiers Eric Packer (silver), Chelsea Holmes (bronze) and Rosie Frankowski (bronze) also collected medals at the championships, and Alaska's junior-level skiers also earned a bounty of medals. No one cleaned up like Caitlin Patterson, who made off with the most dough, baked and otherwise. She pocketed $1,200 for each of her overall wins and $600 for her second-place finish in the 20K, for a total of $4,200. And she walked away with four loaves of bread from The Bake Shop of Girdwood, courtesy of store owner Brian Kari, a former West High skier who provided a loaf of bread to everyone who made the podium. "The first loaf went to some really good French toast," said Margaret Hillhouse, Caitlin and Scott's mom. In Monday's sprint final, Caitlin, 27, came from behind in the final 200 meters of the 1.4-kilometer race to overtake race-leader Jasmi Joensuu of the University of Denver. She won by more than two seconds in 3 minutes, 39.58 seconds. "I used all the double-pole power I had," she said. She said her back was sore from Sunday's 20K, "but I felt so strong in that last heat." 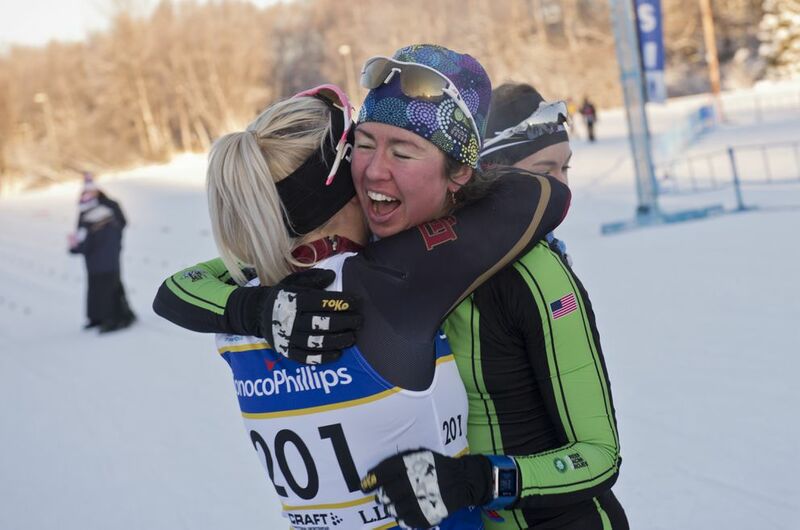 An NCAA All-America skier at the University of Vermont, Patterson stayed in Vermont after graduation and is a member of the Craftsbury Green Racing Project. She made the most of her Anchorage homecoming. She came here as a two-time national champion, and she leaves as a six-time champ. She had never won a major sprint race before, and now she's the reigning U.S. champion in both sprints. "Amazing," she said. "Beyond what I could imagine." Hanneman, who set the pace in the morning qualifying round, held off Kornfield in the final 10 meters of the final to sweep the sprint titles. The two men broke away from the other four finalists early in the 1.6-kilometer race. Coming down the final stretch, both skiers were in the same tracks, with Kornfield right behind Hanneman. With about 10 meters to go Kornfield jumped into his own set of tracks, but Hanneman held on to win in 3:20.62, two-tenths of a second ahead of his teammate. "That was awesome," Hanneman said. "I feel stoked to be in such good form in the middle of January." Kornfield, who collected gold in the 20K, silver in the classic sprint and bronze in the freestyle sprint, is at a peak right now too after being sick about a month ago. "I'm starting to believe again," he said. "This sport is a lot of ups and downs, and it's easy to get caught up in the downs. You just keep your head up and hope for the downs to pass." Hanneman said Kornfield was the most impressive skier throughout the championship series. But confidence in himself carried him through the final. "Obviously he's on super-good form," Hanneman said. "I have to know I have a little more speed than he does, but I can't let up at all. "It was impressive skiing by him all week. It motivated me to drive that thing the whole final." The championships, in Anchorage for the first time since 2010, ran smoothly despite early challenges, including scant snow. Record-high temperatures in the 40s last Tuesday left parts of Kincaid bare of snow and other parts slushy or icy. The first race was held last Wednesday amid 30-degree temperatures and a blizzard, and although conditions that day were sloppy, the storm dumped a few inches of snow. That plus the reappearance of low temperatures made for near-perfect conditions for the remaining races. A dozen Alaska juniors qualified for U.S. teams headed to international competitions. Eight of the 12 skiers who qualified for the World Junior Championships in Switzerland Jan. 27-Feb. 2 are Alaskan, and four of the 12 who qualifed for the U-18 Nation's Championships in Finland Jan. 21-31 are Alaskan. Two more Alaskans qualified for the U-23 Championships, which are also in Switzerland at the end of the month. Leading the Alaska juniors was 17-year-old Gus Schumacher of the Alaska Winters Stars and Service High, the top qualifier for the World Junior team. He placed sixth in the 10K freestyle, 16th in the 30K classic and made the senior men's heats in both sprints. Women's classic sprint — 1) Caitlin Patterson 3:39.58; 2) Jasmi Joensuu 3:41.94; 3) Kaitlynn Miller 3:43.48; 4) Becca Rorabaugh 3:49.50; 5) Petra Hyncicova 3:49.61; 6) Lydia Blanchet 3:50.79. Men's classic sprint — 1) Reese Hanneman 3:20.62; 2) Tyler Kornfield 3:20.82; 3) Benjamin Saxton 3:25.40; 4) Logan Hanneman 3:26.04; 5) Kevin Bolger 3:26.14; 6) Zak Ketterson 3:27.45. Boys World Juniors — Gus Schumacher (Anchorage), Hunter Wonders (Anchorage), Benjamin Ogden, Karl Schulz, Canyon Tobin (Anchorage), Luke Jager (Anchorage). Girls World Juniors — Hannah Halvorsen (Anchorage), Hailey Swirbul (Anchorage), Molly Gellert (Anchorage), Hannah Rudd (Anchorage), Kathleen O'Connell, Sofia Shomento. Boys U-18 — Johnny Hagenbuch, Zanden McMullen (Anchorage), Ti Donaldson (Fairbanks), Haydn Halvorsen, Scott Schulz, James Clinton Schoonmaker. Girls U-18 — Novie McCabe. Sydney Palmer-Leger. Kendall Kramer (Fairbanks), Annika Hanestad (Palmer), Callie Young, Kelly Koch. Women's U23 — Julia Kern, Alayna Sonnesyn, Lauren Jortberg, Lydia Blanchet (Anchorage), Nicole Schneider. Men's U23 — Zak Ketterson, Thomas O'Harra (Anchorage), Andrew Egger, Ian Torchia, Gavin McEwen.